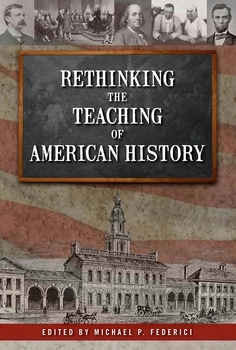 Rethinking the Teaching of American History brings together eight scholars from the fields of American history and American political thought. The first section of the book includes four essays that cover topics that pertain to the teaching of American history. Drawing on the work of Herbert Butterfield, Richard M. Gamble outlines the historian's virtues and he explains why they are essential to the work of both scholars and teachers. Michael P. Federici uses the concept of founding to suggest that historians should be careful to select and define their terms. Insufficient attention to the underlying meaning of key terms can skew one's understanding of history. In a similar way, Mark A. Kalthoff uses the Scopes Trial to illustrate how a historical event can become distorted in memory if historians are not careful about measuring popular depictions of history against the historical record. Chris J. Magoc explains how history teachers can use historical places to bring history to life. The second part of the book provides examples of historical analysis that illustrate the principles and historian's virtues discussed in the first section of the book. This part of the book is highlighted by a lengthy essay by Pulitzer Prize winning author Walter A. McDougall who demonstrates how historians can illuminate American identity by covering a range of historical events and personalities. Gary L. Gregg's essay is a fascinating analysis of George Washington's early life as the antecedent to the iconic Washington. Mark T. Mitchell synthesizes older agrarian principles with contemporary life as a way of demonstrating the compatibility of agrarian virtues and urban life. Gregory S. Butler uses Edward Bellamy's novel Looking Backward to explain the idealistic and utopian roots of twentieth and twenty-first century progressive political and social movements. Michael P. Federici is a professor of political science at Mercyhurst College in Erie, Pennsylvania. He received his Ph.D. in Politics from The Catholic University of America in Washington, D.C. and his B.S. in Economics from Elizabethtown College. Federici has published two books, The Challenge of Populism (1991) and Eric Voegelin: The Restoration of Order (2002) and several articles and book reviews. He has a forthcoming book, The Political Philosophy of Alexander Hamilton, to be published by Johns Hopkins University Press in 2012. Federici served as project director for two Teaching American History Grants from the U.S. Department of Education from 2004-2008.